In celebration of LiveConnections’ 10th anniversary, we dreamed big about accessibility and inclusion in our city. In 2017, we launched a two-year singing extravaganza where EVERYONE could participate in making music together. Young and old. People of diverse abilities and backgrounds. People who love to sing and people who don’t think they can sing at all. We asked: What is a Song? 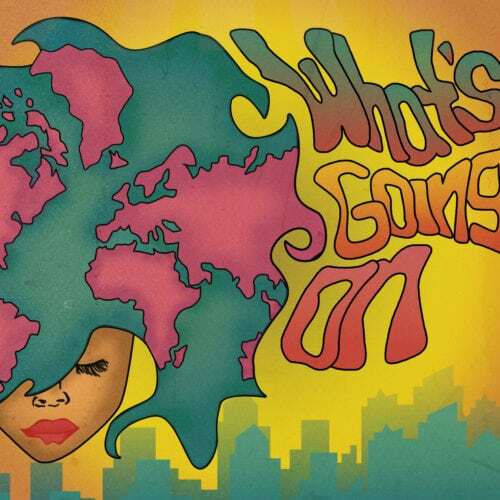 Who is Everyone? What does it mean to Sing? 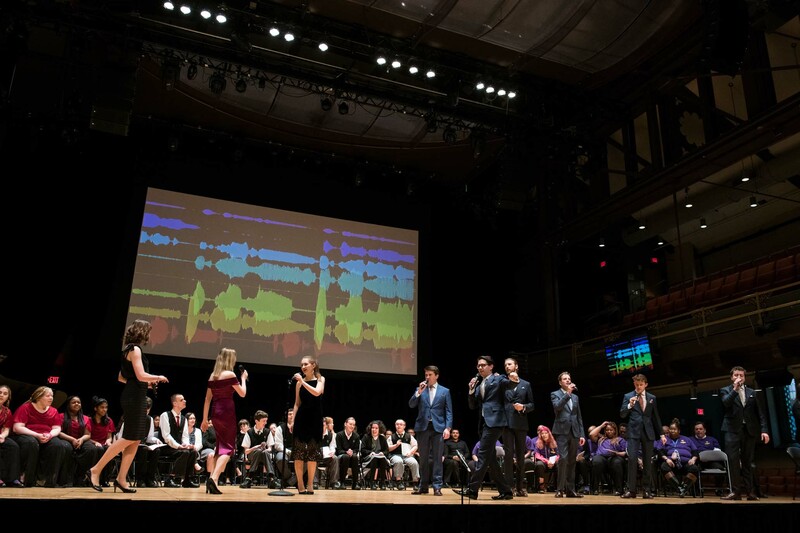 School and community partners collaborated with our artists to create and perform the world premiere of fully accessible choral work. Beginning in the fall of 2017, we hosted workshops with Paul Smith on the “VOCES8 Method.” Co-founder of the renowned British a cappella group VOCES8, Smith developed the Method to tie rhythm and sound to neurological development. 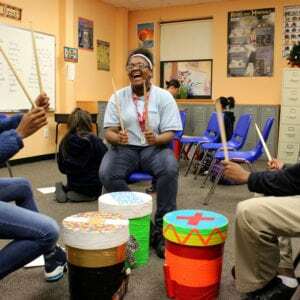 Public school teachers and students, teens with intellectual disabilities, and adults receiving therapeutic services had opportunities to sing and move to a range of music from folk and popular styles. 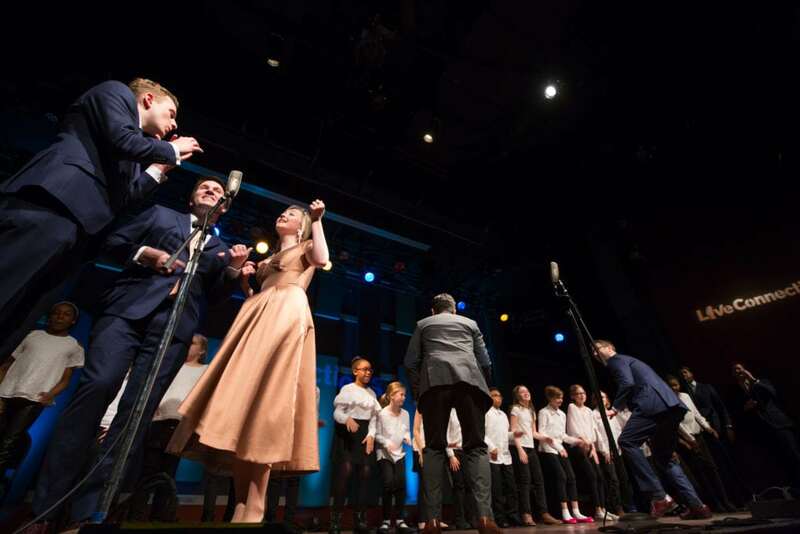 In the spring of 2018, three participating choirs joined VOCES8 on stage for our LiveConnections Presents concert. 60 youth and adults from Germantown Recovery Community, C.W. 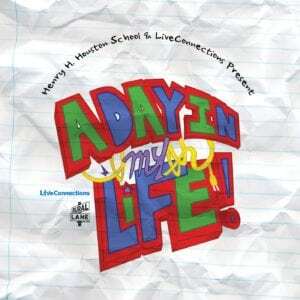 Henry School and Our Lady of Confidence Day School performed with VOCES8 for a sold-out crowd at World Cafe Live. 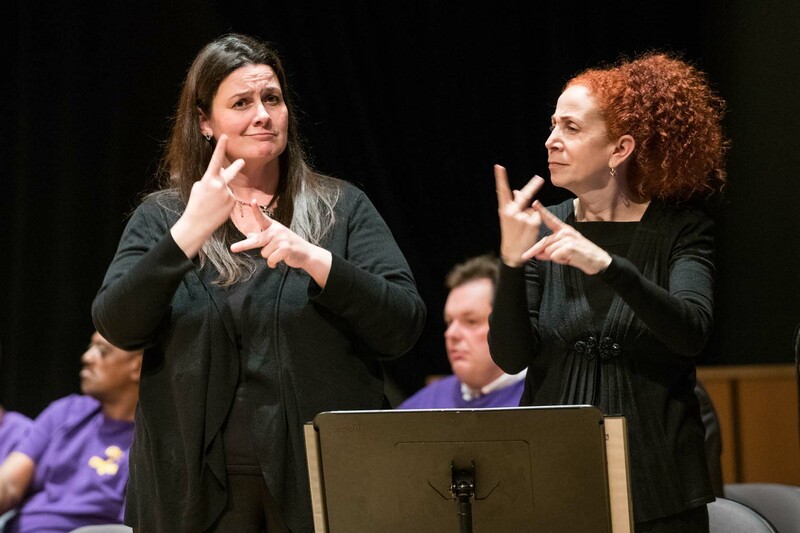 In year two of the initiative (2018-2019), we took the ideas even further, commissioning a new multi-media choral work that invited people with diverse abilities to participate through singing, movement, visuals and technology. Composer Jay Fluellen wrote the music, movement artist Shavon Norris created ways for diverse bodies to participate, and Drexel University’s ExCITe Center used technology to visualize both sound and movement. 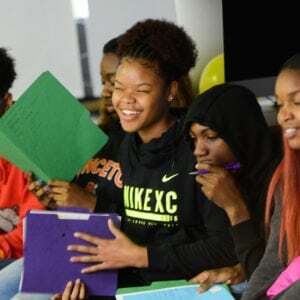 In addition, in a series of workshops throughout the fall of 2018, poet Daniel Simpson worked with school and community choirs to collaboratively generate text and develop ways to participate based on their distinct needs. Our partners at Art-Reach helped us embed Universal Design throughout the planning, music creation and event itself. 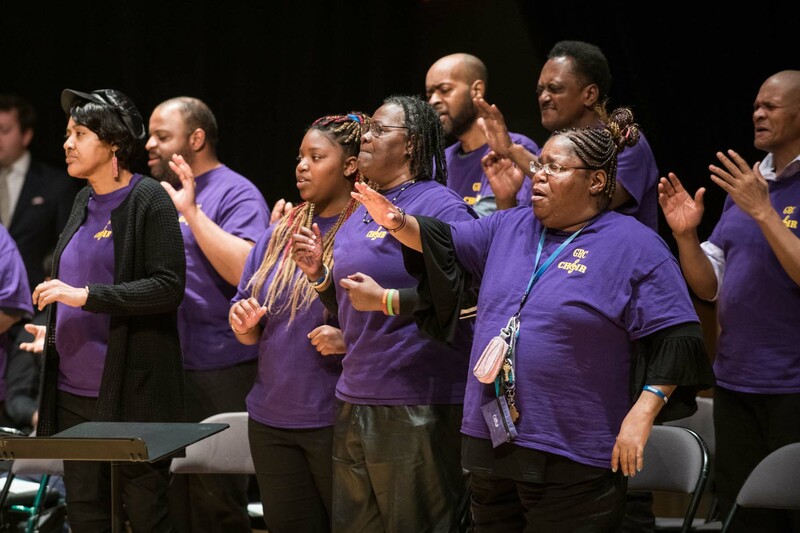 At our culminating Community Sing in March 2019, VOCES8 returned and joined with local partner choirs to present the world premiere of the multi-faceted new work. 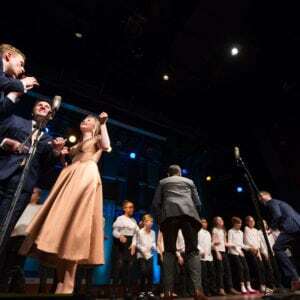 The whole audience was invited to join in the music-making, celebrating human ability and the joy of singing together. 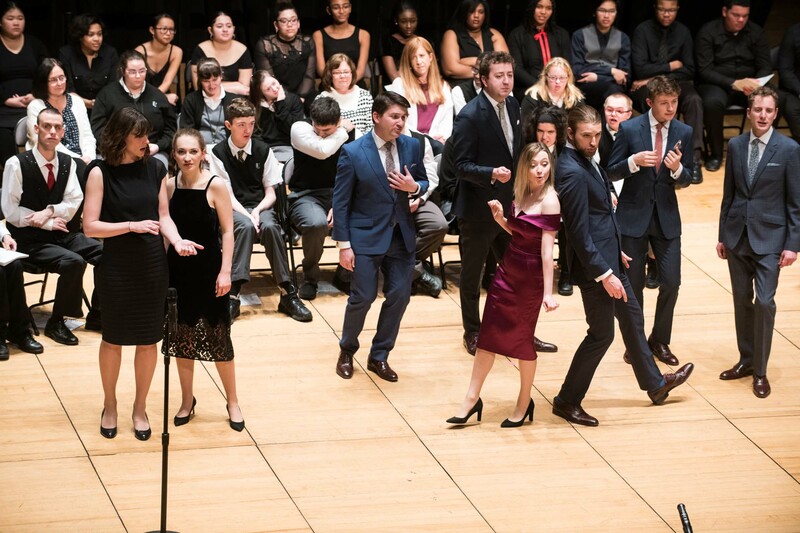 In March 2018, 60 youth and adults from local choirs joined VOCES8 in concert. Jay Fluellen, composer, is a Philadelphia-born musician known as a composer, college professor, educator, accompanist, pianist, singer, and organist/choir director. He is currently a teacher with the School District of Philadelphia at Northeast High School and an organist and choir director at the historic African Episcopal Church of St. Thomas. Performances: on January 14th, 2017, Fluellen accompanied Valerie Gay in three original compositions and three arrangements of music by Hannibal Lokumbe, on March 8th, 2017 his choral composition “O Send Out Thy Light” was performed by Philadelphia All City Choir at the Kimmel Center under the direction of Dorina Morrow, on March 19th, 2017 his Jazz Magnificat and Nunc Dimmitis was performed by the Philadelphia Cathedral Singers under the direction of Thomas Lloyd, and on April 8th, 2017 his commissioned work for the Germantown Poetry Project, Jan Krzywicki conductor, Linda Reichert artistic director, received its premiere, on November 8th, 2017 his commissioned music for the production Walk In My Shoes, Teya Sepunick; director, received its premiere. Shavon Norris, movement artist, is an artist, educator and facilitator. As a dance maker, Norris’ work has been presented at Manhattanville College, The Philadelphia Live Arts and Fringe Festival, Temple University, The National Constitution Center, Art Sanctuary, Chester Eastside Ministries, the CEC, and at Joyce Soho. Daniel Simpson, poet. In 2017, Daniel Simpson and his wife, Ona Gritz, collaborated on two books. Finishing Line Press published a volume of their work entitled Border Songs: A Conversation in Poems last September. This January, Diode Editions released More Challenges for the Delusional: Peter Murphy’s Prompts and the Writing They Inspired, an anthology of prose and poetry, which Dan and Ona co-edited. Daniel Simpson’s collection of poems, School for the Blind, was published in 2014 by Poets Wear Prada. His work has appeared in Prairie Schooner, The Cortland Review, Beauty Is A Verb: The New Poetry of Disability, The New York Times, and elsewhere. The recipient of a Fellowship in Literature from the Pennsylvania Council on the Arts, he served, along with Ona Gritz, as Poetry Editor for Referential Magazine, an online literary journal, from 2013 to 2016. His blog, Inside the Invisible, can be found at www.insidetheinvisible.wordpress.com. Drexel University’s ExCITe Center employs a novel multidisciplinary approach, bringing together design, technology, and entrepreneurship. Their mission is to inspire transdisciplinary research and discovery, connecting technology and communities. Learn more at drexel.edu/excite/. Project-specific support has been provided by the Dolfinger-McMahon Foundation, Musical Fund Society, Presser Foundation and an anonymous donor. Program – Check out the full program from the March 10th concert. Score – Take a look at the canon score for A Song Everyone Can Sing, featured at the end of the program. Know Before You Go – See the guide put together by our partners at Art-Reach. Event Page – Peruse the March 10th page that was featured before the event.